As a photographer, video producer and storyteller, I’ve been looking for new ways to distribute content. One of the fastest growing outlets I’ve seen other photographers using is eBooks. I‘ve created books in the past using Blurb and was able to convert them to an eBook after purchasing a hard copy, but I wanted more control of the distribution. I’ve also made .pdf books that work like an eBook on many devices, but they lack the multimedia features I wanted wanted to employ. Apple has their own iBook publishing software that didn’t offer the flexibility and control I wanted for page layouts and I found the themes confusing to navigate as a reader. While searching for other options, I came cross an iPad app that let me build eBooks on my iPad – Book Creator. To be completely honest, I didn’t have high expectations for it when I downloaded it, but that quickly changed as I started quickly laying out an iBook with photos, video, text, and audio notes that explained the photos. I spent a second day going back and cleaning up the audio recordings, adding extra video elements and making minor adjustments. The process for me was quite simple. I imported my photos onto the iPad using a combination of iTunes and Dropbox. Because Book Creator only accesses photos and videos in the Photo Library/Camera Roll, I imported all of my videos by saving them in Dropbox on my computer, opening them in Dropbox on the iPad and saving to my Camera Roll. Audio recordings can be done right in the app, but I find the iPad mic lacking, even when in a controlled environment. If you wanted to keep everything quick and contained in the app, there are several mics that work well with the iPad to produce good tonal qualities. I used my Tascam audio recorder to record audio, saved them to iTunes, synced them to the iPad and used them on the book. All of it works really seamlessly. Working with photos and content in Book Creator is very simple and intuitive. One of my favorite features is the snapping they’ve implemented to line up objects with the center of the page or another object. I quickly centered images on the page and text below it. Because the book can have multiple images stacked on each other, book design possibilities have few limitations. On the second book I created with Book Creator, I used Adobe Photoshop to create graphical elements to form a visual the theme in the book. Mine were basic because it better reflected the story, but I plan to use textured backgrounds for a future book. Earlier I mentioned that I wanted more control of other distribution of the books, with Book Creator there are two options with many ways to export to them. It creates an ePub or PDF files that can be used on many devices. The ePub file with video and audio elements works really great in the iBooks app. In order to create a PDF version that works across the most platforms, I duplicate the finished file and replace the videos and audio buttons with a screen grab. In Book Creator, you can hyperlink text and photos, so I link from the PDF to the video file on YouTube or a landing page with the video embedded. I then have the ability to sell or give away the books on my own site, put them in iBookstore, or both. Apple’s app and Blurb are both restricting in distribution options and creating them in InDesign takes more work and is pricey to own (or rent in the new Creative Cloud world). 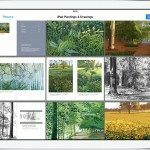 Photographers, if you are looking for a quick and easy way to create eBooks for your portfolio, to share tips, or give your clients another option, this is a quick and intuitive way to get it done inexpensively while not sacrificing quality. Tony Cece is a humanitarian photographer and video producer who also self-publishes the books he makes. Like your story tony. keep publishing those books. might have to give one a read. sounds awesome.